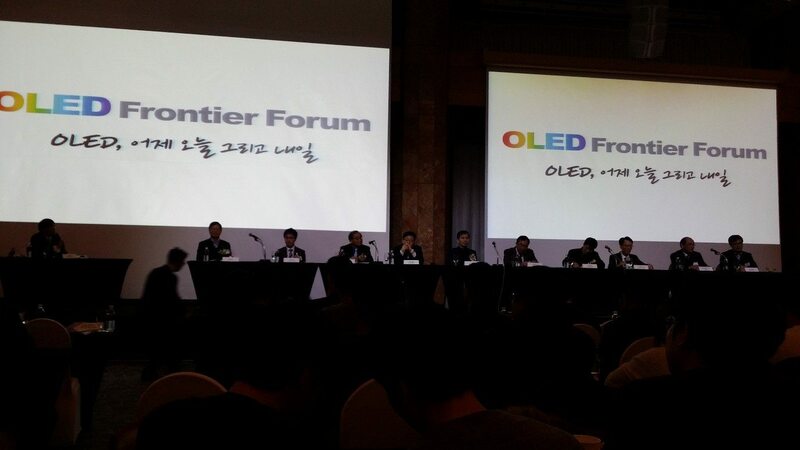 On January 28, OLED Frontier Forum, ‘OLED, Yesterday, Today, and Tomorrow’ was held in Seoul, Korea. With approximately 250 attendees from the industry, academia, and government organizations, experts discussed scenes from the early days of OLED development, the current market and technology competition status, and future industry development issues. President of UBI Research, Choong Hoon Yi, was the first speaker of the first section, and gave a presentation titled ‘Korean OLED Industry Creating Something from Nothing’, introducing figures from the initial stages of OLED development and now. In 1996, Yi, in charge of Strategy Technology Planning of Samsung Display Devices (now Samsung SDI), calculated OLED to be the most powerful display inheriting from LCD. Asserting the need for development, Yi led the OLED research development investment. Discussing the most influential people within the 20 years of OLED industry, Yi first mentioned Samsung SDI’s vice chairman Soon-taek Kim, explaining that despite the IMF crisis Kim decided on AMOLED investment and laid the foundation for Samsung’s main role within the OLED industry. On top of this baiss, Ho Kyoon Chung (then Samsung SDI’s vice president) began active development of small size AMOLED, and Samsung Display’s vice president Sung-Chul Kim is responsible for Samsung’s OLED for mobile device of now. Yi also introduced Miwon Commercial’s CEO Kyu-Ha Chung (then Samsung Electronics executive director) as the key player who suggested vision for large area OLED through world’s first development of 40 inch WRGB OLED. Within LG Display, vice chairman Sang-beom Han was mentioned as the person responsible for OLED TV’s market release through difficulty decision of large area OLED investment, and CTO In-byeong Kang for technological advances as the person in charge of OLED development. For academia, Yi discussed Seoul National University’s Professor Changhee Lee as the first person in Korea who began white OLED development and contributed to OLED standardization. 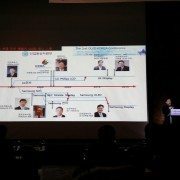 Professor Jin Jang of Kyung Hee University suggested oxide TFT’s commercialization prospect and mentored many people who contributed to Korean OLED industry. Yi, together with Sung-Chul Kim and Dr. Nam-Yang Lee (then LG Philips LCD director) established OLED sector within Korea Display Industry Association. 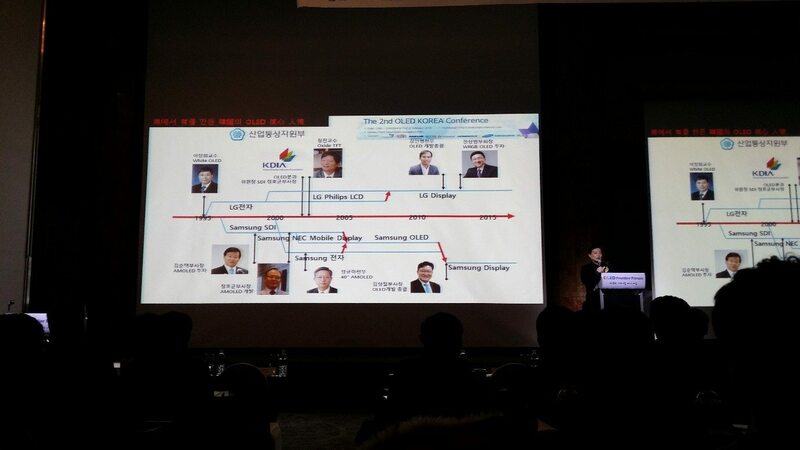 During the talk, he introduced how this formed the inter cooperative structure with OLED industry companies and contributed to Korean OLED industry success on the basis of governmental support. 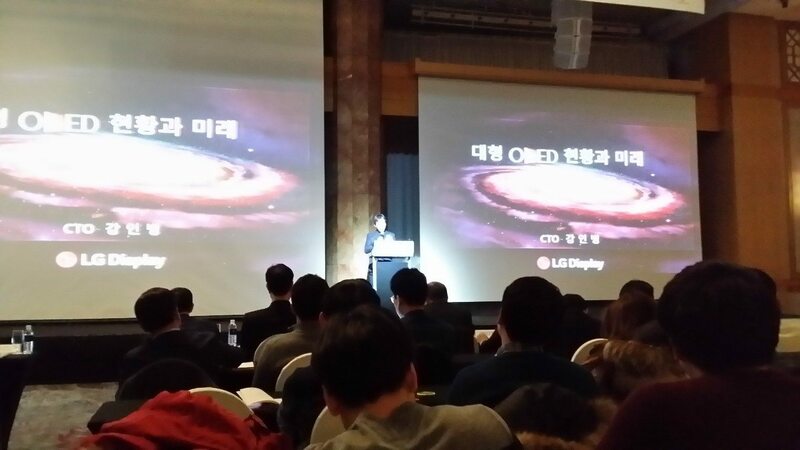 In the second section of the event, LG and Samsung’s CTOs presented on OLED industry’s key issues, and future innovative technology. The 2 companies both discussed current technology, products and projects that need to be solved in order to increase the competitiveness of OLED. During the last section, the speakers panel discussion handled how to respond to China’s rapid growth. The speakers all agreed on the need for acquisition and hold on experts, corporation between industry and academy, and between companies, and new application areas. Sumitomo Chemical revealed that they are planning to enter the general lighting market with solution process applied P-LED (polymer OLED). Sumitomo Chemical is a company developing polymer and solution process applied OLED lighting panel. 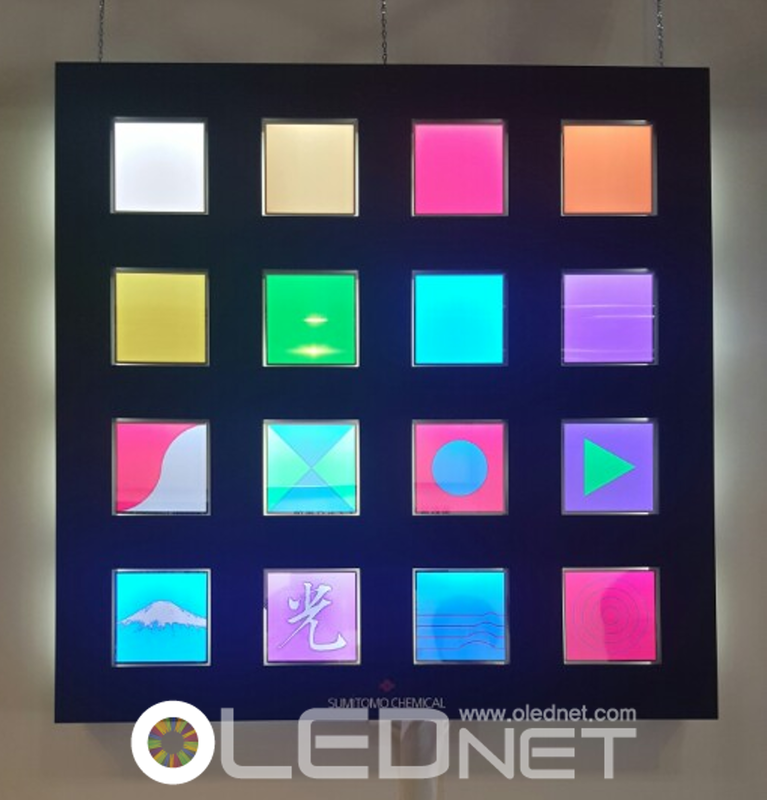 The company began actively selling decorative OLED lighting panel from H2 2015. In Lighting Japan 2016 exhibition, Sumitomo Chemical announced that through their polymer materials and process technology, 80-90% of evaporation materials efficiency, and lifetime of approximately 20,000 hours at white 60-80 lm/w have been achieved. 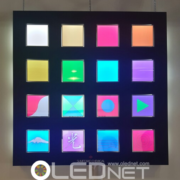 From 2017, they are planning to commercialize solution process OLED lighting panel as general lighting, as well as for decorative use, and revealed that the biggest issues are cost and improvement of consumers’ OLED awareness. According to these issues, Sumitomo Chemical explained that although the cost of emitting area formed through solution process, cost down of evaporation formed emitting area and electrode part is required further. Although the 20,000 hours of lifetime is satisfactory, as consumers are aware that LED lighting’s lifetime is 40,000 hours or longer, Sumitomo Chemical pointed out it is important to change consumer’s OLED lighting awareness and understanding of lighting products. OLED panel, mostly used for Samsung Electronics, is expanding its market and slowly entering China. In CES and IFA until now, Samsung Electronics and LG Electronics only exhibited OLED panel equipped smartphone. However, this time, China’s dark horse Huawei exhibited Samsung Display’s OLED onto new smartphone model Nexus 6P. The panel used is 5.7 inch 518 ppi FHD OLED. According to Huawei, although until now LCD has been used as OLED can produce profound black it is estimated OLED will be highly popular in Chinese market. Huawei is already using OLED on smartwatch. Huawei Watch Active that began to be exhibited starting with CES 2015 uses 1.4 inch 286 ppi OLED panel with 400 x 400 resolution supplied by AUO. The thickness of the watch is 4.2 mm and rather thick, but the external design is highly detailed and beautiful much like luxury analog watch. As Huawei, which has the highest market share out of Chinese set companies, started to actively push for OLED panel use in smartphone following smartwatch, other Chinese companies, including Xiaomi, are expected to rapidly join the OLED sector. Skyworth, the most enthusiastic Chinses TV company, placed OLED TV on the front of the CES 2016 booth, the largest space. The exhibition concept, same as IFA 2015, was promotion of OLED TV’s superiority over LCD in terms of picture quality and fast response time through car racing game. Furthermore, all OLED TVs exhibited this year are UHD resolution aiming for the premium TV market. According to Skyworth, 2015 OLED TV sales performance is 45,000 units, with the target of 200,000 units in 2016. 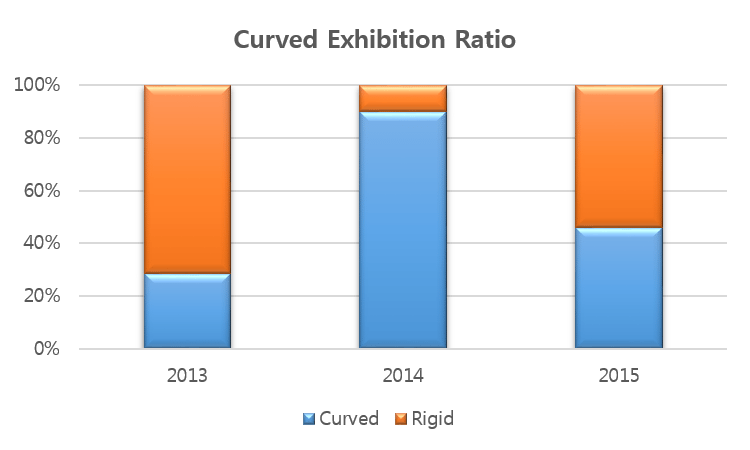 In 2015, the performance was weak as the OLED panel supply from LG Display was not smooth. However, compared to last year, in 2016 the panel supply from LG Display increased, and as OLED TV is a very popular product in Chinese market due to its superior picture quality compared to LCD the sales target of 2016 became much higher. What is different about this exhibition is the fact that the video clip used in the Skyworth OLED TV booth is the same as the NASA video produced by LG Electronics for promotion. Previously, each companies presenting OLED TV used different contents on the screen. However, in this exhibition, by showing the same video of the sun within the space, they emphasized OLED TV’s superiority in contrast ratio and picture quality of black. This is considered LG’s ecosystem strategy to secure OLED TV territory by sharing the video contents and increasing the consumers and attendees’ OLED TV awareness. 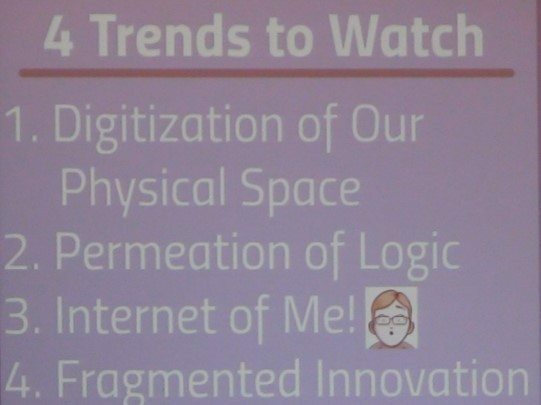 [CES 2016] What is This Year’s Trend? A maturing of nascent ecosystems. Ambient sensing includes products with motion/touch sensors, calorie analyzing sensor, and products that automatically adjust water volume after checking the weight of the laundry. Aggregated learning’s representative technology and products are driverless vehicles. Lastly, the maturing of nascent ecosystems includes VR (virtual reality), UHD, wearable device with health and fitness function, drone, 3D printer, and smart home. Compared to last year’s trends, what has been most changed was the part where the automotive related technology was introduced as adaptive customization within permeation of logic in CES 2015. However, this year the aggregated learning was changed to autonomous vehicle (i.e. driverless car) and demonstrated CES’ high expectations for future automotive industry. http://jpn.olednet.com/wp-content/uploads/2016/01/123.png 490 781 OLEDNET http://jpn.olednet.com/wp-content/uploads/2015/09/logo_oled.png OLEDNET2016-01-05 20:48:092016-01-05 20:49:13[CES 2016] What is This Year’s Trend? LG Electronics actively began aggressive marketing for OLED TV. In IMID Exhibition (October 14-16), LG Electronics installed an OLED comparison experience zone to allow the visitors to see OLED TV and LCD TV at once. This direct comparison exhibition with OLED and LCD is the 2nd one after one in WIS 2015. In this exhibition in IMID Exhibition 2015, LG Electronics presented their new 2015 release 55inch UHD LCD TV and 55inch UHD OLED TV. This is considered a reflection of LG Electronics’ determination to target the market through OLED TV rather than LCD TV. LCD TV is illuminated through BLU and therefore difficult to achieve perfect black. Through IMID Exhibition 2015’s comparison experience zone, LG Electronics emphasized OLED TV’s merits such as perfect black, perfect viewing angle, and ultra slim design. Since the release of OLED TV, LG Electronics continued presentations that emphasized OLED TV’s advantages in diverse exhibitions. However, recently they are pursuing aggressive promotion focusing on OLED even exhibiting comparison against their own latest LCD TV. On the other hand, their rival Samsung Electronics is maintaining their 2-track strategy of using OLED and LCD in different applications each. The industry is focused on how these development will affect the large area TV market. At IAA 2015 (September 17 – 27), Audi and Porsche presented OLED lighting and display equipped vehicles. In the past, Audi has proved OLED technology’s excellence through diverse models and demonstrations, including introduction of ‘swarm’ in 2013 with its 3D OLED car rear lighting panels. At this motor show, Audi revealed Audi e-tron quattro, the first concept car with Matrix OLED technology. As well as the Matrix OLED lighting, interior OLED display was also applied to the concept car. Audi explained that the Matrix OLED lighting, which was applied to the rear lighting, can continuously change lights and does not cast shadow. Full OLED interface was also applied to the car and all functions required in driving can be control by display touch. Audi revealed that they will gradually apply these technology to next generation Audi series. Porsche presented their first four-seat electric sports car Mission E as a concept model. The instrument cluster for this concept car is displayed virtually in OLED. The menu can be activated through buttons on the handle. It can also be automatically activated as the cluster’s eye tracking system can perceive the driver’s attention. The display also follows the seat position and body attitude of the driver in what is known as a parallax effect; the display moves according to the driver’s posture for easier viewing. Porsche revealed that Porsche Car Connect technology will also be applied which will allow the user to control key functions of the vehicle through a smartphone. As OLED using lighting and display are actively applied to smart cars, attention on the automotive OLED is also increasing. At the National Research Development Industry General Workshop, held in July 2015, Samsung Display and LG Display each stated their thoughts on display that will be applied to future smart cars. Samsung Display’s executive director Hye Yong Chu asserted that smart is display’s future, including smart car. She also explained that for the actualization of smart technology, other ancillary smart technology, such as eye tracking and voice recognition technology, are required. Yoon Sooyoung, LG Display’s vice president, stated that automotive display can be used for CID, dashboard, cluster, and window, and that the development of transparent and flexible technology is necessary. 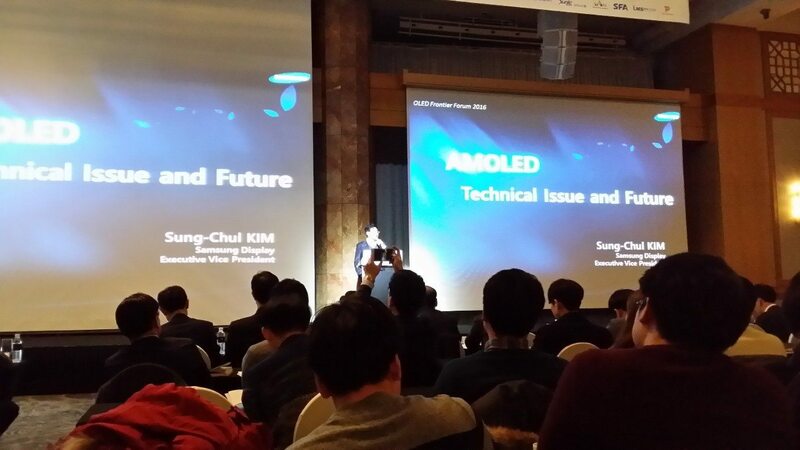 During the keynote session of IMID 2015, Munhyun Kim of Hyundai Motors revealed that OLED panels will mainly be applied to smart car compared to LCD as it can easily be flexible. He also added that the automotive OLED’s percentage within the total OLED market will increase, and anticipated that it will exceed 30% in 2017. IFA 2015 that opened on September 4, closed its curtains on 9. 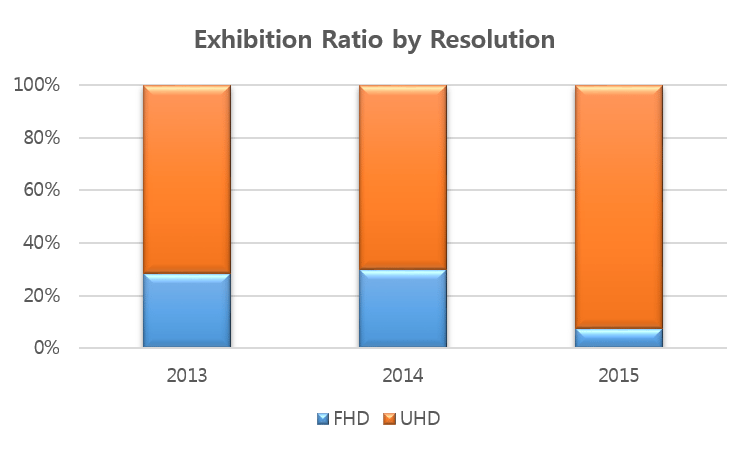 This year’s IFA was similar to IFA 2014 in terms of diverse OLED TV exhibition, but when analyzed in detail there were several differences. First, the emphasis on UHD TV greatly increased. The percentage of UHD resolution of exhibited OLED TV was approximately 71% in IFA 2013, and 70% in IFA 2014. However, in IFA 2015, the percentage increased to approximately 92%. If the main theme for IFA 2014 was curved OLED TV products, UHD was the keyword for IFA 2015. Another important factor is increasing participation by Chinese companies. In IFA 2013, only Haier exhibited OLED TV but this increased to 2 companies, Changhong and TCL, in IFA 2014. In IFA 2015, 3 companies, Haier, Changhong, and Skyworth, presented OLED TV. 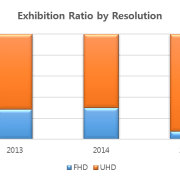 It is estimated that the OLED TV exhibition attendance by Chinese electronics companies will continue to consistently increase. There is much attention on how many more Chinese companies will participate with OLED TV in IFA next year, and whether a new keyword following UHD will appear. Although IFA 2015 ended, OLED TV market continues to move.